Bermuda grass originally came from the savannas of Africa and is the common name for all the East African species of Cynodon. It grows in open areas where there are frequent disturbances such as grazing, flooding, and fire. where ever a node touches the ground, forming a dense mat. It also reproduces from roots under the ground. It has a deep root system, and in drought situations the root system can grow 47 to 59 inches (120-150 cm) deep. Most of the root mass lies 24 inches (60 cm) under the surface. Its blades are a gray-green color and are short, usually 1 to 4 inches (3-10 cm)long with rough edges. The erect stems can grow 0.3 to 1.3 feet (0.1-0.4 m) tall. The stems are slightly flattened, and an inflorescent purple in color. Bermuda grass reproduces through seeds and through runners and rhizomes. The seedheads are on 1-3 inch (3-7 cm) spikes and are themselves about 2 inches long. Bermuda grass will put out seeds about 3 months after planting. The seeds germinate at temperatures above 68° F (20° C), and begin to grow within 2 weeks. One plant can cover an area of 3 square yards (2.5 sqm.) in just 150 days after germinating. Bermuda grass can grow in poor soil. During droughts the upper parts die off, but the grass will keep growing from its rhizomes. It prefers moist and warm climates, and where there is more than 16 inches (410 mm) of rainfall a year. Bermuda grass is an early successional grass, and is first to grow back after grass fires, which burn quite often on the African savanna. To the Hindu in India, bermuda grass was a sacred grass because it fed their sacred cows. In ancient Roman days they squeezed the juice from the stems and used it as a diuretic and and astringent to stop bleeding. 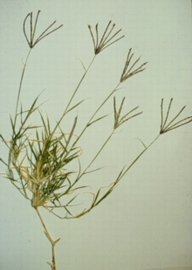 Bermuda grass is considered a very invasive and competitive weed. Few herbicides are effective against it. Before mechanized farm machinery, bermuda grass was the farmer's worst weed. However, back then it saved thousands of acres of farm soil from erosion. It was the most widely grown pasture and turf grass in the South. Bermuda grass is highly nutritional for cattle and can be fed to sheep.